Aequorea victoria. Image credit: Sierra Blakely/Wikipedia. 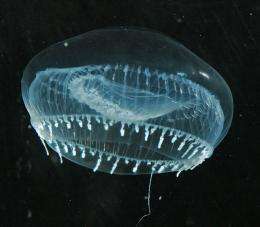 (PhysOrg.com) -- Researchers in Sweden have been liquidizing thousands of specimens of a common North American jellyfish to extract a protein that could be used in microscopic fuel cells. The jellyfish (Aequorea Victoria) contain a green fluorescent protein (GFP) that makes them glow in the dark, and a research team led by Zackary Chiragwandi from the Chalmers University of Technology in Gothenburg, Sweden, has been extracting the protein and using it to create a bio fuel cell. When a droplet of the protein is placed onto aluminum electrodes and then exposed to ultraviolet light an electric current is generated at a nanoscale suitable for powering "nanodevices". Nanodevices are devices measured in nanometers, where one nanometer is a billionth of one meter. Their use in medicine is in its infancy, and one of the chief difficulties in working with nanoscale devices is powering them. Chiragwandi has also used his fuel cell with light-emitting enzymes derived from fireflies and sea pansies (Renilla reniformis) that create their own light source, making the fuel cell completely self-contained. In other research, methods have been developed to grow artificial green fluorescent protein in the laboratory using bacteria, and if successful this would create the GFP without the need to harvest and liquefy large numbers of jellyfish. Other light-powered cells, such as Grätzel cells (which mimic plant photosynthesis), use elements such as titanium oxide, which make them a much more expensive option for powering nanodevices. Since the jellyfish protein fuel cells can also generate their own light, no outside source of light is needed, making the process simpler and more efficient. Chiragwandi says the fuel cells could be used to independently power nanodevices operating in the human body for applications such as fighting or imaging tumors, medical diagnosis, communication devices, or perhaps even reversing blindness. If scaled up they could also be used like thin films to make cheaper solar cells. The technology could become available within one or two years.